Do you like the idea of relaxing in bed, but don’t always feel like lying down? Or maybe you like to sleep with a slight incline or decline? Well, now you can. The Rize Contemporary II adjustable bed is here and ready to help. 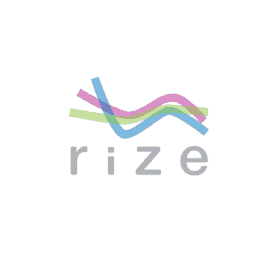 Is the Rize adjustable bed worth the money? Continue reading below to find out! Don’t have enough time to read the full review? Click here to skip to the summary. The Rize Contemporary II adjustable bed is built from a steel base with a poly foam liner around the edges and an upholstered polyester cover. The foundation contains two motors (one for the head and one for the feet), as well. 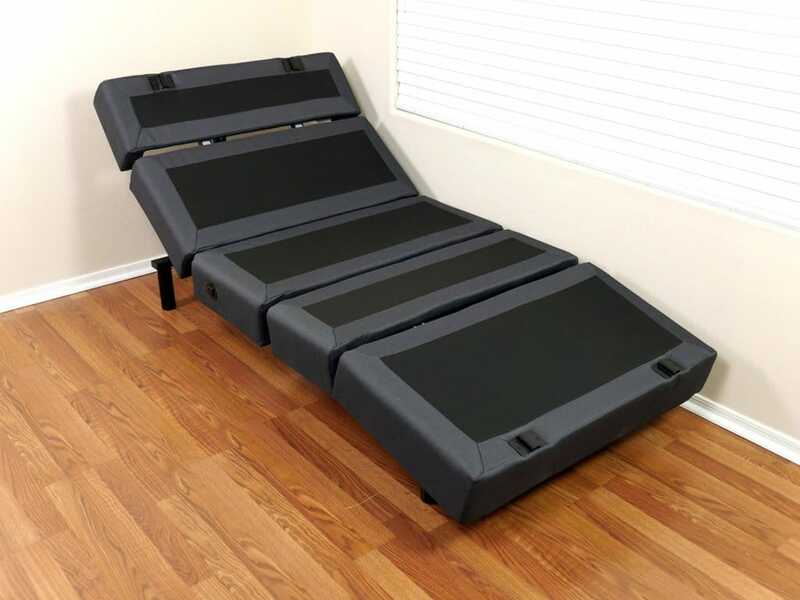 Additionally, this adjustable bed’s platform, is broken into five different sections, allowing for easier transitions from flat to incline or decline. A/C ports are also embedded into the Rize Contemporary II. There is one A/C port per Twin XL base. The overall build quality of the Rize is quite impressive. Throughout my sleep test, every function ran smoothly and did so while remaining relatively quiet. Assembling the Rize adjustable bed was extremely easy. The Contemporary II bed frame comes completely built, with the exception of the legs. Therefore, the only assembling you have to do is attach the legs to the bottom of the foundation, and you’re good to go. The total process took about five minutes to complete. 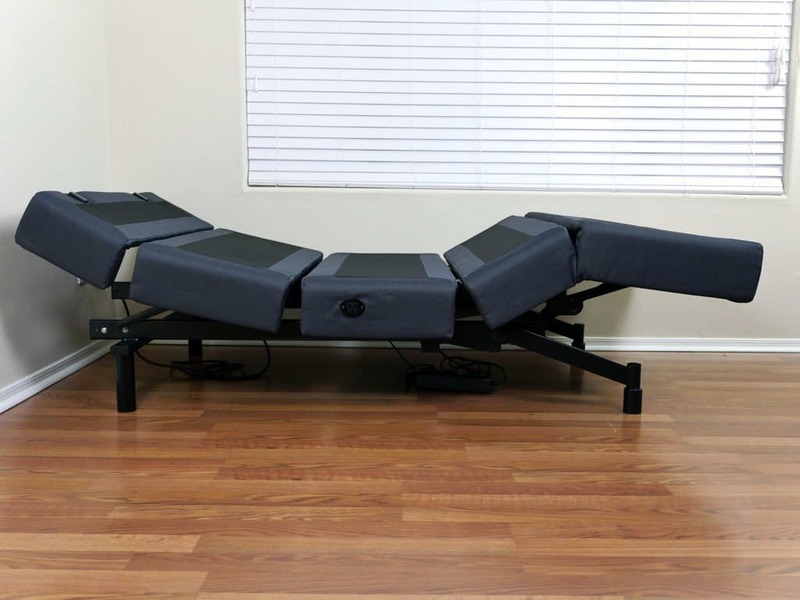 From unboxing the foundation to screwing in the legs, the Rize Contemporary II adjustable bed was virtually painless to assemble. Some additional assembly is required for attaching a headboard. The parts are included with the foundation, but they are not affixed. Although I did not add a headboard to my Rize foundation, the instructions seem quite simple. Based on the ease of assembly around the legs, I would expect the headboard attachments to be fairly easy. Sleepers also have the option to clip on mattress retainer brackets along the foot of the bed. These literally clip onto the bed frame and work to hold your mattress in place. The Rize Contemporary II adjustable bed frame does a fine job of supporting the mattress as well as the sleeper. While I do primarily sleep on my stomach, I forced myself to sleep on my back and side while on the Rize because the adjustable features are not designed to support stomach sleepers. With so many different incline and decline features available, I had to work my way through each position to really put the Rize to the test. That said, I spent most of my time sleeping on my back, and the Rize did an excellent job of providing support through the different incline / decline positions. While sleeping on my side, I received good support as well, but there are certainly less positions available for side sleepers. The Rize Contemporary II bed frame has a plethora of features, ranging from under-bed lighting, dual-zone massaging, a wireless remote, and more. First, the Rize allows you to manually adjust the level of incline or decline you would like to receive around your upper or lower extremities. Additionally, there are three programmable, pre-set memory positions: anti-snore, zero gravity, and lounge (all controlled by the wireless remote). The anti-snore position will raise your head, helping to open your airways and reduce snoring, as the name suggests. This position can also be beneficial for sleepers who have congestion, heartburn, acid reflux, or for those who simply want to sit up in bed and watch TV, read a book, or play on their phone before going to sleep. 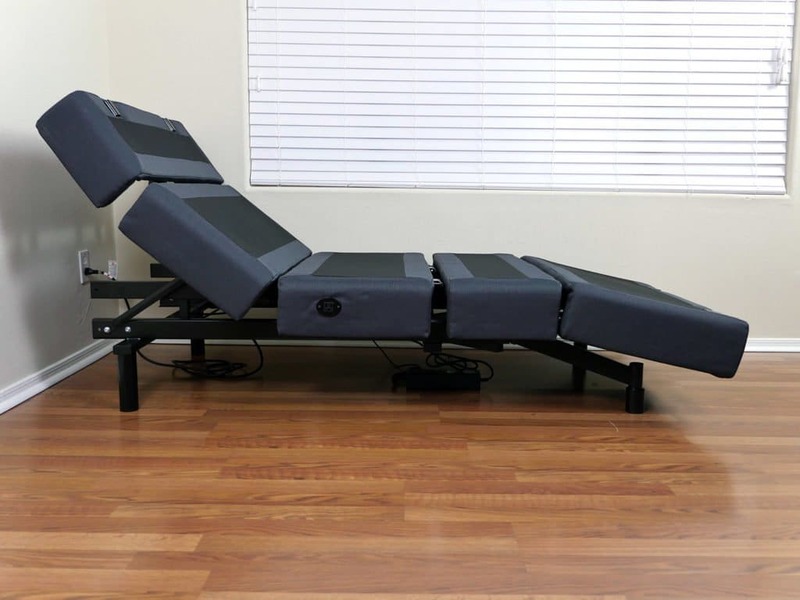 Zero gravity raises the lower end (foot) of the mattress in order to improve blood flow, relieving pressure while also helping aches and pains. Finally, the lounge position is designed to take stress off the lower back, enabling sleepers to lounge in a comfortable position. This can be nice for working on a laptop, watching TV, etc., as it creates a feel similar to that of a recliner. The remote also includes a “flat” button, which will return the mattress to its flat state, regardless of its current position. The Rize adjustable bed also includes extensive massage functionality. Just like the position options, the Rize allows sleepers to choose which area of their body they would like massaged. For example, sleepers have the ability to select a specific section of their body (lower or upper) to be massaged at varying intensity levels. Full body and wave mode are two additional massage controls listed on the wireless remote. Full body, as it sounds, will massage your entire body all at once. Just to clarify, the massage feature is working from the base, through your mattress, onto your body. It is not a direct massage to your body from the base. On the other hand, wave mode will work in a wave-like motion up and down your body. Wave mode also contains three levels of intensity. Finally, the massage motors will automatically shut off after 15 minutes of use. This helps prevent any wear and tear on your mattress in addition to helping cool down the motors. From more of a technological angle, the Rize Contemporary II adjustable bed frame also offers two A/C plugs for ease of access when plugging in phones, laptops, etc. There is also an LED light affixed to the bottom of the mattress that helps provide a soft light in the night. This light can be controlled by the remote and is only bright enough to light up a few feet around the bed, simply helping to illuminate the area around your mattress when getting in and out of bed. Finally, the remote control. Although the remote may not seem like a large part of the process, it actually makes a big difference. The Rize’s remote control offers one-touch settings. 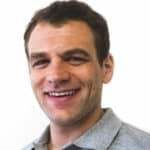 In other words, you’re able to press the pre-programmed feature you want to occur just one time and the bed will automatically make the necessary adjustments. This is compared to other remotes that require a constant pressing of the button to accomplish the position you’re wanting to be in. The combination of a user friendly remote and the quiet transitions between positions makes for a well rounded adjustable bed. Weight – A Twin XL bed weighs 167 pounds. Headboard– While the Rize Contemporary II does not include a headboard, it does include accessories and a bracket so you can add your own if you desire. 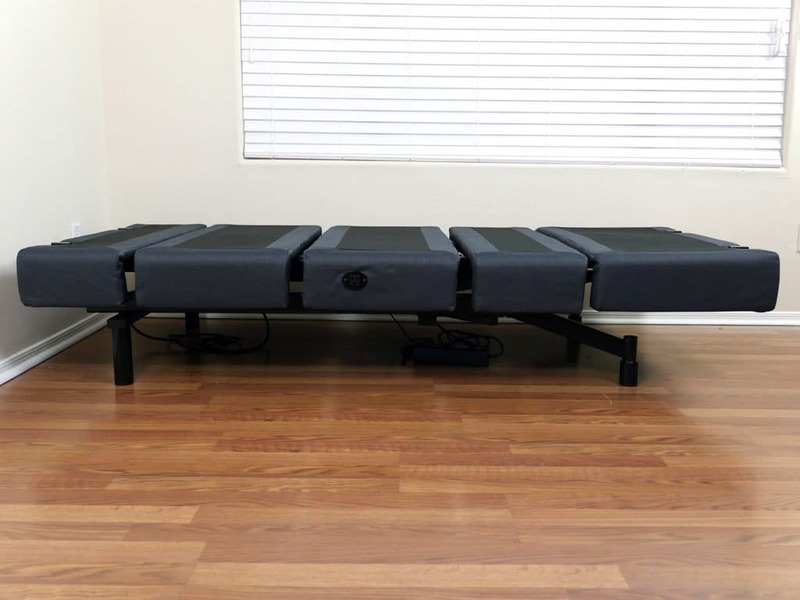 Who should buy the Rize Contemporary II adjustable bed? Want contemporary look & design – The upholstered cover of the Rize Contemporary II adjustable bed frame creates less of a bed frame look and more of a luxurious platform bed aesthetic. Want massaging features – The ability to massage sleepers is one of the Rize Contemporary II’s top features. You have the ability to massage just your upper or lower body, your whole body, or receive the massage in a wave-like motion. Want under-bed lighting – The Rize Contemporary II adjustable bed offers an LED light under the frame. The light is dull enough to avoid waking partners, but bright enough to provide sleepers with a navigational night-light. 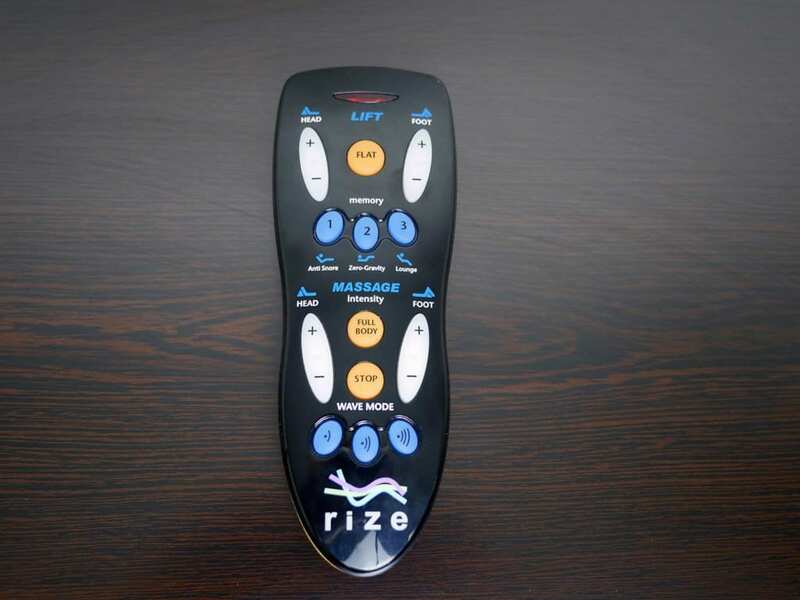 Want pre-programmed settings – With the wireless remote provided with the Rize Contemporary II comes three pre-programmed settings, including zero-gravity, anti-snore, and lounge. A single press on the button will automatically set the adjustable bed in these positions. For more information on the Rize Contemporary II adjustable bed frame, check it out on Amazon. The Rize Contemporary II adjustable bed brings a lot to the table. A long list of features, including pre-set positions, massage, under-bed lighting, and A/C adapters help round out a luxurious adjustable bed. If you’re in the market for a new foundation and like the idea of being able to manually change the level of incline or decline you receive by a wireless remote, the Rize can be an excellent choice for you.